The Broad museum is a hot spot for both locals and tourists alike. If you’re planning on heading to the museum, here are some tips to make your trip easier! Tickets go quickly, so the best way to ensure you can visit is to go to their website and reserve a ticket. Tickets can be reserved up to a month in advance. If you don’t reserve a ticket, you can always go to the Broad early and join the standby line where tickets are given on a first come, first served basis. Depending on the day, the wait can be as short as 10 minutes or as long as 90 minutes on weekends. Be aware that special exhibits cost a fee to enter. While most of the galleries and exhibitions, such as the Infinity Mirrored Room, are included in the general admission, there a couple of special exhibits that are around $10 to enter. Perhaps the most well-known piece at the Broad, “The Infinity Mirrored Room” is in high demand. Therefore, guests must enter their name on the waitlist at the iPad kiosk station that is located in the lobby. Be sure to add your name quickly as the waitlist may sometimes fill up. Once inside the mirrored room, you only have 1 minute inside, so be sure to get your camera ready so you can snap the perfect picture. Staff at the Broad aren’t just there for security purposes. All staff members are trained professionals who know about the artists and the various pieces at the museum. If you’re interested in a particular section, ask one of the staff for more information! Download the Broad app before your visit. The app will give you access to five different types of tours such as a family-friendly tour or the artists-on-artists tour where one artist who has pieces on display discusses other artists who are on display. The Broad advises guests not to bring coats or large bags as there is minimal storage space for these items. Also, if you carry a backpack, you will likely be asked to wear it backward, so you don’t accidentally knock an object over. 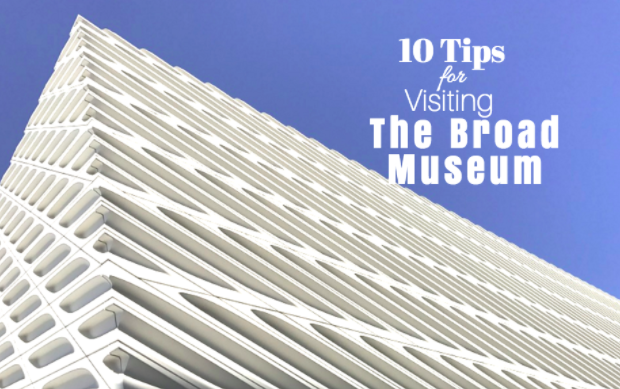 If you plan on waiting in the standby line or visiting the museum, follow the Broad on twitter. They will tweet out updates throughout the day including if lines for exhibits are open or closed for the day. A parking lot is available at the Broad. You’ll have to pay $12 for 3 hours, but the fee might be worth the convenience of finding a parking spot. There’s no food or drink allowed inside the museum so be sure to eat beforehand. The good news is that there is often some food trucks lined up outside so feel free to enjoy before or after your trip to the Broad!